Roscoe Wilson was born and raised in northern Indiana and southern Michigan. His environmental values were shaped in this mostly rural Mid-western setting which enabled him to experience nature and discover an awareness that only a forest, lake, and field can offer. 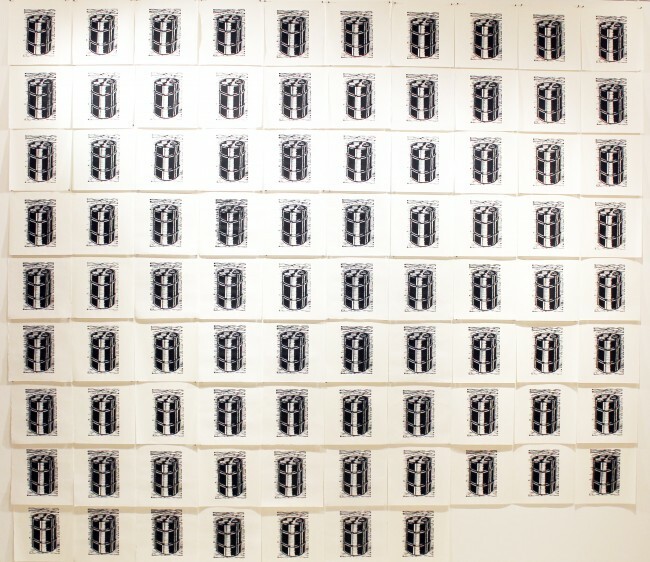 Wilson earned a BA degree (1997) from Wabash College in Indiana, a MA degree (1999) in Painting/Printmaking from Purdue University in West Lafayette, Indiana, and a MFA degree (2002) from the University of Wisconsin (UW) – Madison where he furthered his interdisciplinary education by studying Printmaking, Sculptural Installation and Painting. While at UW he also studied the history of environmentalism and drew inspiration for his artwork from former Wisconsin residents and environmental pioneers like John Muir and Aldo Leopold. After graduate school, Wilson moved to Boston, Massachusetts, and worked for Skinner Auction House, the Museum of Fine Arts, and the Boston Center for Adult Education. In 2003 he joined Miami University Hamilton in Ohio where he is currently an Associate Professor of Art. Wilson has exhibited his work widely. Since 2005, he has been included in more than 30 national and 6 international Juried Exhibitions, as well as in various regional and invitational shows. He is the recipient of several grants and awards from various organizations and institutions including the Puffin Foundation Inc., Summerfair Cincinnati Aid to Individual Artists, the Butler County Department of Environmental Services, Miami University. 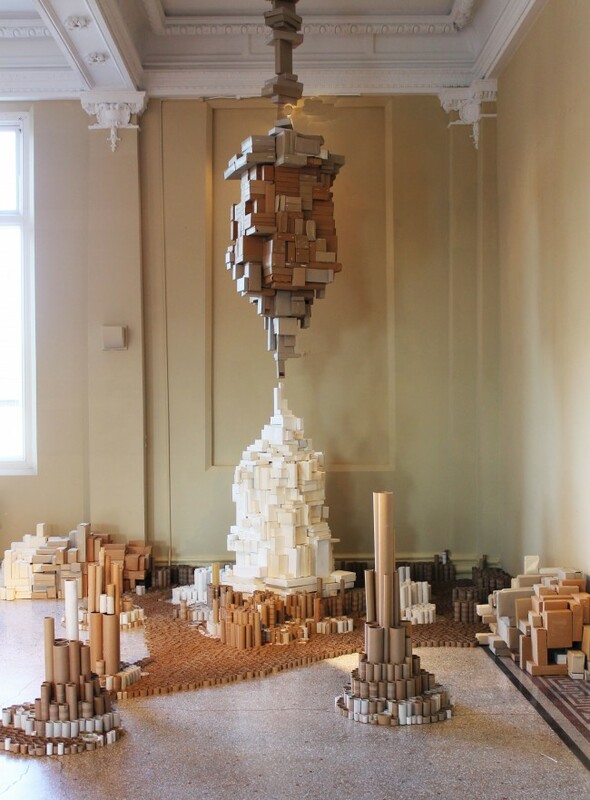 In his work, Wilson has consistently raised concerns about over-consumption, waste, destruction of the environment, polluting energies, climate change. The deleterious effect on the planet of burning coal, oil and natural gas; the devastating result of oil spills on the ecosystem; and the green potential of alternative sources of energy – solar, wind and geothermal – preoccupy him and find their way into his art. Wilson’s installation work recently has primarily involved the dilemma of consumerism and waste in contemporary society. Even though consumerism is a natural attribute of the human condition, Wilson feels that one should not live to consume and that we ought to be more conscientious about what, why, and how much we consume and waste. 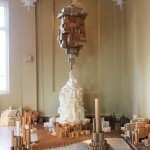 As an artist, he thinks it is his responsibility to bring this paradoxical dilemma to the public eye through his art. 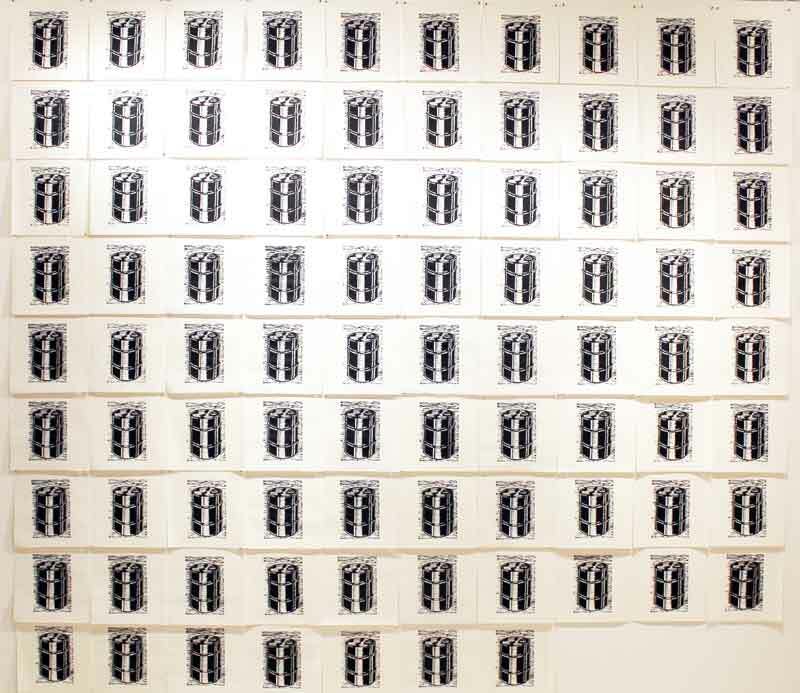 Wilson’s print installation titled 87 Days consists of 87 copies of the same linocut print depicting an oil drum. It refers to the number of days it took to stop the 2010 Deep Water Horizon (BP) oil spill in the Gulf of Mexico where millions of gallons of oil spewed into the ocean. It took eighty-seven days before the well could be capped. Questions still remain regarding the long-term effects of the spill on the environment, also about safety regulations and companies’ negligence. ‘It’s Getting Hot Out Here’ is an installation consisting of blue, white and black plastic container caps with one single white plaster cast of a polar bear illuminated by a red light. The caps surround an oil drum, moving from black to white to blue. The colors signify the oil spill on the arctic landscape that is breaking apart. The polar bear has become a symbol of the blight of the arctic environment and the destructive effect of fossil fuel usage on its habitat due to climate change. Wilson feels that the abuse of these technologically outdated fuels, the structure of our current society and political system, and the unwillingness to change are all factors that can and will be devastating to our environment and our lives and will eventually result in the destruction of wildlife habitat. Also that change needs to happen right now and not in the future for our grandchildren, but for us, in the present, because it is already hot out here. 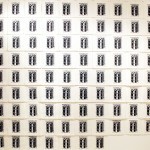 Wilson’s installation ‘Innocent Oil’ incorporates 196 white plaster oil drums, 2”x4” each, placed on a black glossy wall. The number relates to the 19.6 million barrels of oil consumed every day in the United States (2010 statistic). Each plaster oil barrel represents 100, 000 actual barrels. The title refers to the inherent ‘innocence’ of the oil companies and how the material has now spilled out of the container and spread across the environment. 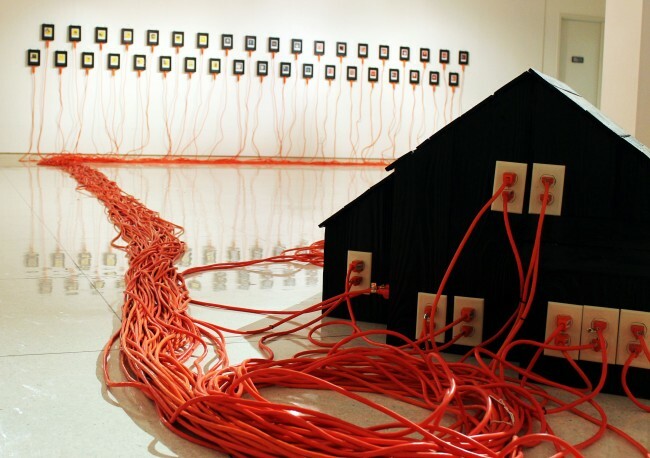 Wilson’s installation titled ‘Eclectic Electric’ addresses the issue of overconsumption of fossil fuels, namely coal. 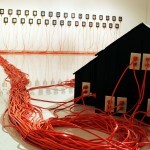 Framed paintings mounted on the wall represent each a different electric device found in his home. They are plugged into the miniature version of his house that becomes a domestic power station. 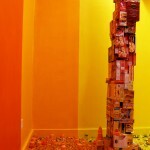 ‘Beautiful Consumption VI’ consists of large box constructions that become stalactites and stalagmites. They are surrounded by round areas of toilet paper rolls, paper towel rolls, tape rolls, puddles and pools of water on the ground. Wilson created this artificial landscape to represent an ultimate product of our activities, drawing in the viewer by its neutral color and texture but also repulsing the viewer as soon as he/she realizes that it all consists of commonplace waste. 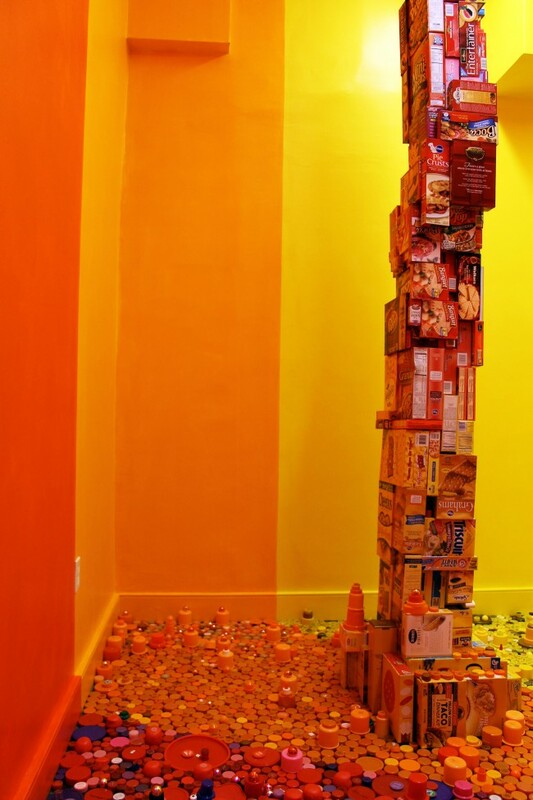 The installation ‘Beautiful Consumption V, Red, Orange and Yellow’ represents a collection of post-consumer materials that Wilson collected over several years. 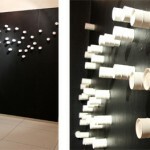 They consist mostly of paperboard boxes from everyday products like cereal, pasta, toothpaste, etc. also of plastic container caps recovered from soda, water, laundry detergent bottles, etc. The reclaimed materials had been cleaned, sorted and organized. 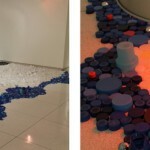 The plastic container caps were the only warm tones of the installation and Wilson painted the walls in colors to match that warmth. He intended the environment to overwhelm and engulf the viewer. Jean Syed was born in Lancashire, North of England, and educated at Birmingham University in the Midlands. It was at a time when one applied to local education authority for a grant, not a loan. After graduating she worked as a social worker for several years then decided to study law. By then she was married and had a son. Her husband sought after by G. E., the family relocated in the United States. Feminism, or the latter part of it, was then all the rage, so she decided, just to be perverse, to become a housewife. Actually Syed liked it, especially on rainy days. She has lived in the same house in Loveland for thirty-three years, and with the same husband. She is a poet who has been published by St. Anthony Messenger, Bird Watchers’ Digest, Dos Madres Press…, has been broadcast on W.V.X.U. and will have soon a book of nature poems published by Kelsay Books of California. • Middle classes, especially those in the suburbs, insulate themselves using their private cars wherever they go. Vehicles emit a lot of pollution and usually are used by only one or two individuals instead of the many, like with a bus. 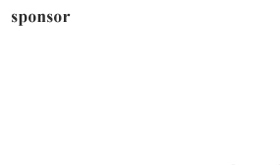 On the other hand, people who don’t own cars and who live downtown, may have no means to get to many places, like for instance to Stonelick Lake, one of the State Parks of Ohio for which they paid in part through their taxes. It often becomes up to churches and welfare organizations to get them there, but their freedom in deciding when and where is then lost. One man Syed knew and who lives downtown was found in possession of a gun and prohibited from driving by a judge; as a result he couldn’t get to his distant place of work. Buses, if readily available, would have solved his problem… The man in her poem “On the Bus” was mentally ill, and so thankfully couldn’t drive. People in the suburbs, where sidewalks are scarce, also end up using their cars, instead of walking, in order to be safe. as if we were long lost bosom buddies. none of us press to have the route extended. Well, he shriveled those impudent rags on bones. embarrassed our lightheartedness to death. from the contagion of the underclass. • One cannot explore a gated community; the gate usually bars the way. There are gated subdivisions everywhere nowadays. What does it imply for those who are outside? Are they criminals? Well, they may have guns, but so do those on the inside. The George Zimmerman trial illustrated well the case. So why the gates at all? Why us and them? asks Syed. Gates are the utmost discrimination, a discrimination that once applied primarily to African-Americans. Today it applies to the poor who are also predominantly African-American and who remain largely on the outside. Syed’s poem “Ghetto” addresses this unfortunate situation; it is a poem about the poor and racism. Money on gated lots atop each hill. Few ever saw them, so they won’t be missed. Most ulcerous, that gouge into the creek. Minorities are here so that’s topnotch. Though long may they live in another place. • Syed’s mind was alternating between what she saw outside and what she saw on television. She wrote “Starvelings” in the 1980’s and what she saw then on television is still the same years later – flies in the eyes of black children, just like the birds picking flies from bark in the trees outside. Charities do help in Africa, but in reality the problem is all the result of the exploitation by the West. Whatever the reason, Syed still feels for those babies with flies in their eyes and she’s afraid that tomorrow it will still be the same. Turning on only a monochrome day. The far woods are eroding into lime. With flies that salivate round nostrils, eyes. Normal service brings its norm of sorrows. Who got in front of the second amendment. Our mind-set is to blame. To be protected from violence. To victims and to God. Of the quest for domestic tranquility. I’ve known Jean Syed for many years and have read and enjoyed her poems. Each one is always unique and memorable and makes one think about the world in new creative, important, sometimes even frightening, ways. That is a good thing. Jean Syed’s poems are powerful. She took me along On The Bus; I felt the shame and sorrow of her Peace Offering. My prayer is for plowshares to return and for words to become mightier than swords and vulture-type capitalists. The wait is long.